The Archie Comics brand has been one of the longest lasting franchises in pop culture history. Since their first appearance way back in 1941, the “Archie Gang” have been the stars of countless comic books, spin-offs, television shows, and movies, with a visual aesthetic that is almost synonymous with comics in general. While the main Archie brand is still going strong, the past several years have seen some… interesting off-shoots of the series. The crew branched off into horror with the surprisingly successful Afterlife with Archie series, which launched the Archie Horror imprint. 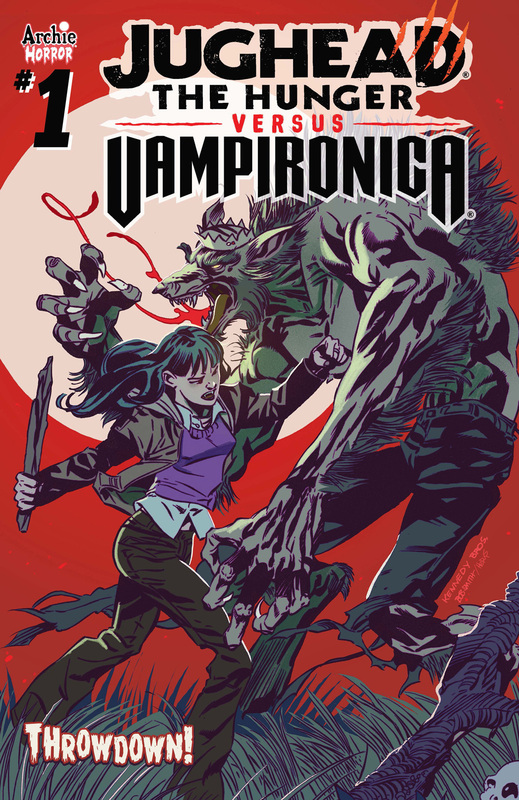 Since then, several off-the-wall titles have come to fruition, including Jughead: The Hunger (where Jughead Jones is a werewolf) and Vampironica (where Veronica Lodge is a… well, you can probably guess). Later this month, the lupin Jughead and Vampironica will face off in the five-issue miniseries Jughead: The Hunger Vs. Vampironica, from the mad genius that is Frank Tieri. Check out the preview of the first issue below, which makes the days of Archie crossing over with the Punisher seem almost quaint. Jughead: The Hunger Vs. Vampironica #1 will hit comic shops and digital retailers on April 24. Feb 15 Jughead Jones rights (food-related) wrongs in Archie's "Jughead's Time Police"